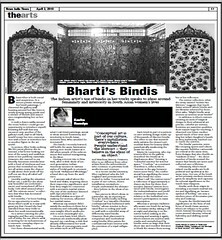 Click here to read “Bharti’s Bindis“, a review of Bharti Kher’s first show at Hauser & Wirth, London. (“News India Times”, 2 April 2010). Bharti Kher is both social and suspicious. At a recent private viewing of her bindi paintings, I observed the gallery staff buzzing around her like bees to newly-sprung spring petals and a stream of friends and associates congratulating her on her show. It took a dozen walks around the room before I grabbed the perfect opportunity to introduce myself, knowing full well that any moment now another of the gallery’s soldiers clad in all black, a poor and paradoxical attempt at blending into the egg shell-painted walls, would tempt her into conversation with a beer or introduce her to another figure in the art world. In person, Bharti looks nothing like her press photos: she is, instead, a far better looking version of the weary and smile-less artist in her publicity materials. However, she reacted to my friendly American introduction with a level of tiredness and suspicion that reminded me that not all artists enjoy the chance to talk about their work off the cuff nor are they all rabid self promoters. Quickly reading the situation before me, I told her the show was beautiful (an understatement) and meandered off for a lucky thirteenth whirl around what I call “the mirrors room”, a collection that Kher has decorated with bindis, forehead decorations popularly worn by women in countries such as India, Pakistan and Bangladesh. For months I’ve been looking for an opportunity to write about Kher’s work so it was with great joy that I heard that she had travelled from New Delhi to share her work internationally. As a writer covering the photography and fine arts coming out of India, Kher’s work is exciting for its inclusiveness of a common, everyday object in South Asia, bindis, as the focus around which Kher creates mixed-media sculptures. Her three-dimensional works, what I call bindi paintings, speak to ideas around femininity and interiority in South Asian women’s lives. Who wouldn’t be interested? The bindi, I recently learned, still holds the same fascination among non-South Asians as it did when people of the subcontinent first started immigrating to the West. During a recent trip to New York, after showing a slide show presentation of second-generation Indian-American women in various styles of bridal garb to promote my book “Bollywood Weddings”, a hand shot up from the audience. A woman asked about the bindi and tilaka, inquiring about their respective significance and how they might be connected with a woman’s marital status. The rest of the audience listened with rapt attention as I described tilakas as a type of make-up for women, whatever her marital status. Whereas my answer didn’t satisfy the audience’s thirst for a revelatory and culturally significant answer, Kher’s works provide a more meaningful and culturally-insightful one. Two pieces in Kher’s show, in particular, are as stunning as they are intellectually exciting. “Confess” is a “sizeable Christian confessional box bedizened with bindis” whose interior is decorated floor to ceiling and wall-to-wall with a colourful array of differently-sized bindis. However, their placement is scrupulous and methodical: using bindis, Kher paints the confessional box’s interior with the precision of a royal calligrapher. Each bindi is part of a pattern or over-arching design made up of thousands of discreet bindis. The effect is one that immediately satiates the viewer’s primordial thirst for beauty and while paradoxically awakening the desire for more. Maria De Lamerens, who represents Kher at the gallery, described the bindis as “a diaphanous skin”, forming a “colourful exterior for interior space”. “Confess”, as a reviewer describes it, reflects Kher’s “interest in the gap between inner/outer lives”, the confessions box signifying the inner and the bindi the outer. In addition to Kher’s mirrors creating an aura of magical design in their whimsical yet precise, colourful yet serious, feminine yet assertive qualities, their texture begs for touching. I observed one brave mother spend much of her time swatting her infant daughter’s hands as they stubbornly reached out to touch the mirrors. The bindis’ patterns, some like creeping sperm and others like acquatic bubbles, cartoonish yet critical at the same time, form designs that also double as “markers of time”: the sheer number of bindis remind the viewer that bindis are worn and collected over a lifetime. Ultimately, Kher’s bindi mixed-media works are both political and apolitical at the same time. Her use of the bindi as her primary medium interrogates its simplicity and captures its cultural significance in the South Asia Diaspora. Bindis are a modern piece of decorative jewelry and make-up, has its origin in revealing a woman’s marital status and symbolic of an “arcane symbol of fertility”. Despite their material significance in the lives of millions of South-Asian women, Kher’s art refuses to be politicized, instead focusing on concerns around identity, cultural hybridity and shifting social mores. 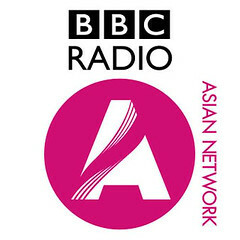 Click here to read about “Bollywood Weddings” in “NRI Today” and “South Asian Bride Magazine“. 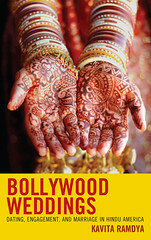 Click here to read Jen Richman’s article “Bollywood Influences Hindu Weddings in America” in “India New England“. 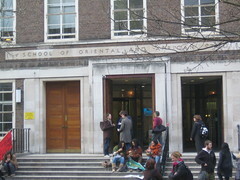 This afternoon I gave a talk at SOAS, the University of London’s School of Oriental and African Studies: it was my first speaking event in London. The crowd was made up of undergraduate students and a smattering of mature students, people at the end of their careers looking to return to school. Many of the attendees weren’t South Asian, but they had a deep interest in Indian culture and film. 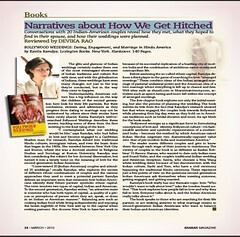 Click here to read Devika Rao’s “Narratives about How We Get Hitched“, Khabar Magazine’s review of “Bollywood Weddings”(March 2010).